Please refer to our stock # 11052 when inquiring. This stunning vintage pin measures 3 1/2" long x 3" wide and is hand wrought from sterling silver. 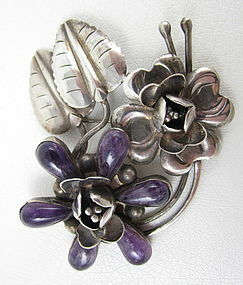 The six almond shaped petals are cut from amethyst stone with inclusions. It is quite dimensional and beautifully executed. It is in excellent condition and the reverse is signed "Mexico Silver".